Delineators are used in many different ways. Because they are lightweight and easy to move and store, they are a great option for temporarily redirecting traffic, blocking areas and temporary road closures. Unlike Bollards which tend to be heavier and used more as an obstruction to traffic and to protect from ramming, delineators are lighter weight and serve a more visual capacity to help direct traffic. However, they are still sturdy and their flexible material will withstand impact if needed though they might not stay upright. 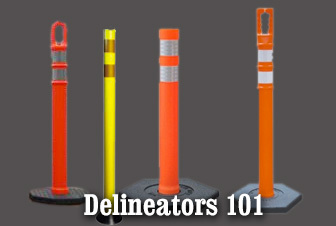 There are different versions of delineators. One of the most common is the simple open top delineator which is highly visible and portable. They can be purchased with or without reflective bands. The ring top delineator and claw delineators are similar but have an opening at the top to allow for use of caution tape with the delineator. The caution tape can either be held in the claw or wrapped around and through the ring. One of the popular delineator models is the DP 200 Series post which is a 3-inch round channelizer made of polyurethane. Polyurethane is the toughest flexible plastic available and is extremely flexible. Even at extreme temperatures it returnsto an upright position after impact. The DP 200 posts are highly visible both day and night and help to delineate driving lanes with bright colors and reflective sheeting. It has been NTPEP tested and meets the requirements of NCHRP 350 for Category 1 Devices. The most important things to look for in selecting delineators is durability and visibility. All the delineators at Traffic Safety Warehouse meet MUTCD (Manual on Uniform Traffic Control Devices) standards. If you need help in determining the best traffic control device for your project, give us a call and we will be happy to help you.